Operator Training Simulators Market size is set to exceed USD 20 billion by 2025; according to a new research report by Global Market Insights, Inc. The increasing adoption of the robotic technology in industrial sectors is anticipated to drive the operator training simulators market growth. Technological advancements & innovations in several industries are compelling businesses to provide effective training programs to employees regarding new technologies. The operators need to be aware of each component, part, functions, and features of the equipment for effective handling and management of the system. The software-based training allows operators to have a clear and detailed understanding about the equipment & its operations. It helps businesses to improve the overall productivity and reduces the chances of system damage or failure. The growing adoption of operator training simulators market in the aerospace & defense industry to train pilots or astronauts for flying aircraft or space shuttle will drive the market growth. In February 2019, General Atomics Aeronautical Systems, Inc. collaborated with Sankhya Infotech Limited to provide the simulation technology to pilots, operators, and maintenance crew. The rise in government regulations to maintain safe enterprise operations for reducing the fatalities and injuries is expected to augment the operator training simulators market demand. The technology is reducing capital investment costs and enabling process yield improvement. The simulators provide safer operation while enhancing productivity and performance. Several government organizations have developed programs and policies to ensure the safety of workers or employees in different application segments by implementing simulation-based training module. For instance, Federal Aviation Administration introduced National Simulator Program to improve the aviation safety through the implementation of standards and regulations that govern the qualifications of Flight Simulation Training Devices (FSTD) and seek continuous improvement in flight simulation. The industry needs to comply with the standards for improving the safety of its workers, accelerating the operator training simulators market demand. Head Mounted Displays (HMDs) are witnessing a high adoption in the operator training simulators market due to the increased interactivity with the virtual environment. With the growing popularity and adoption of AR & VR technology, the demand for HMDs has increased. Adoption of the technology in the flight training & automotive sector is increasing at a rapid pace. It allows businesses to provide a real-world experience to their employees, enhancing the training programs. Traditional fixed display technologies are being replaced with the HMD-based simulation training modules. Moreover, it is easy to evaluate the performance of operators with the help of HMDs. Simulators can compute and display the operator’s longitudinal & lateral control performance in real-time, positively impacting the market growth. Rapid change in the electric grids globally is driving the adoption of simulation tools in the energy & power sector. The micro-grid control & process power systems are increasingly supporting the local isolation operation and interconnected operation with transmission systems and distribution. Several developed economies are engaged in modernizing and replacing traditional central station grid design with sustainable distributed power sources, booting the operator training simulators market growth. Similarly, the developing countries are constructing new power grids with a wide range of distributed generation sources. The sector is witnessing an increase in complexities in the management of the distribution generation asset and its connection to the transmission systems, driving the need for advanced solutions. Several companies are developing innovative solutions specifically for the energy & power sector, that are used for training and controlling the system operations. For instance, in July 2017, ABB Ltd. announced the launch of Process Power Simulator to provide the effective tool to train, test, and optimize the operation of a process power grid, providing an impetus to the operator training simulators market. In 2018, the North America operator training simulators market accounted for around 40% of the industry share and is expected to witness a steady growth owing to the increased demand for skilled workforce in industrial sectors. With the rapid establishment of the business base of global companies, the need for industrial workforce is growing rapidly. High costs in employing skilled labors in the U.S. and Canada are encouraging companies to implement innovative technologies to promote and train their existing employees. Moreover, the increased investments of global companies in providing training and skills to their employees will also drive the operator training simulators market share. For instance, in February 2017, Intel’s new Chandler facility based in the U.S. will generate over 3,000 jobs. The company is investing nearly USD 7 billion in construction and management of the facility & staff. The simulators in the facility will help businesses to train such large number of employees with minimized cost & time, providing an impetus to the market demand. 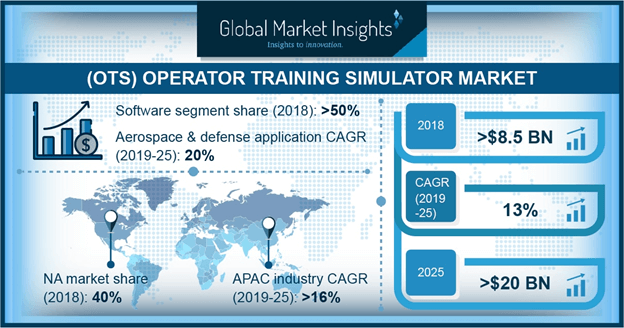 Major companies in the operator training simulators market include Andritz Group, DuPont Inc., ESI Group, FLSmidth & Co. A/S, Yokogawa Electric Corporation, Siemens AG, Schneider Electric SE, HyperionRSI Simulation, Honeywell International Inc, Immerse Learning, EON Reality Inc., Aveva Group PLC, ABB Group, and Applied Research Associate, Inc. Players in the market are involved in developing customized solutions based on the industrial requirement, allowing businesses to implement a training module that will support business operations and tasks. For instance, CORYS offers customized solutions that allow customers to develop certification programs for the console operator.